When Henry Daniel Justi arrived in the United States from Germany in 1850, no one imagined that a new age in dental technology would soon be starting. As a modest apprentice in a Philadelphia instrument shop he developed new ideas and procedures for the modeling of porcelain teeth. Working during the day and studying at night, Justi succeeded in obtaining new materials which were capable of reproducing the structure of natural teeth and which were better than the porous porcelain in use at that time. This impressive discovery resulted in Justi’s partnership with one of the most important companies in the field. In a short time, Justi’s technical abilities led the entrepreneur to take over his partner’s shares and to give a decisive winning boost to the factory. From the factory, which was built in Philadelphia in 1880, the business expanded in the United States and eventually all over the world. 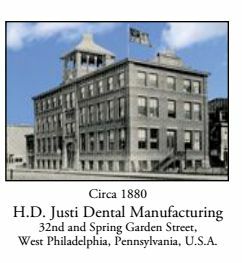 Under the direction of the sons and grandsons of the founder, the company eventually proposed new materials, technology and molds for improving the function of artificial teeth. In 1937 Justi took advantage of the unique properties of acrylic resin to manufacture the most natural looking artificial teeth. In September 1940 Justi introduced the first plastic tooth line to the world at the American Dental Association convention in Cleveland, Ohio, and has been making hardened plastic teeth since that time. In 1980 the factory was transferred from Philadelphia to Oxnard, California, finally merging with American Tooth Industries in 1986. With their expertise in shading, blending, curing and carding of teeth, Justi now manufactures six lines of hardened plastic teeth, all of which are distributed worldwide. Justi also formulates and manufactures a wide range of chairside and laboratory products. 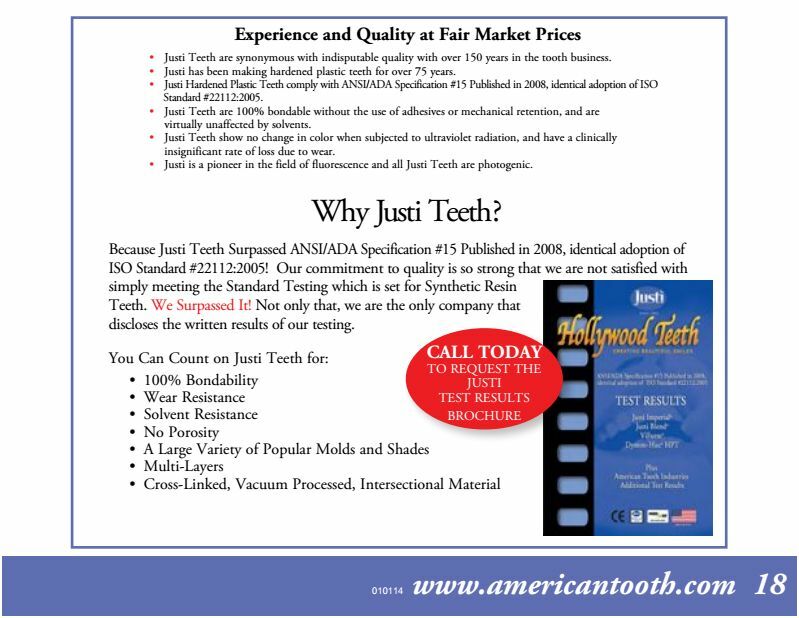 Justi Hardened Plastic Teeth comply with ANSI/ADA Specification #15 Published in 2008, identical adoption of ISO Standard #22112:2005. See more about the Justi Lines: Justi Imperial, Justi Imperial ViVO, Justi Blend, ViForm and Dymon-Hue.